Khamy Ganeshathasan is an associate at RV Law. While she has experience in many areas of law, she has honed her skills and expertise in the area of Family Law and Multi-disciplinary Mediation. Khamy believes firmly in resolving disputes without ever having to step foot in a court room. She strives to ensure that her clients fully understand the issues they are faced with. Khamy is passionate about providing clients with Alternate Dispute Resolution options where possible and is presently pursuing her Masters in Law in Dispute Resolution at Osgoode Hall, York University. 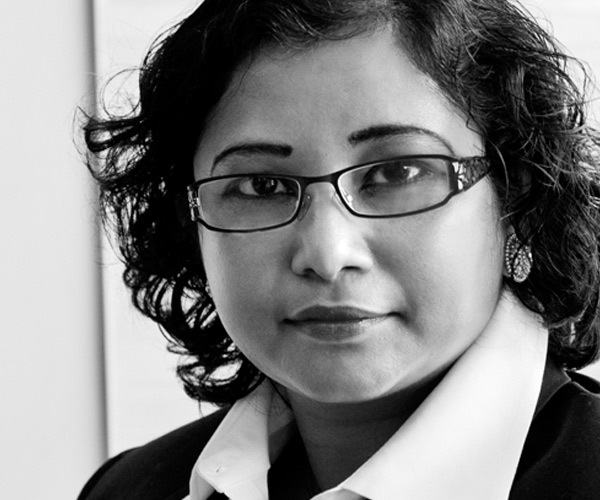 Khamy was called to the Bar Council of Tamil Nadu and Puducherry, India in 1998 and to the Ontario Bar in 2010. Khamy has appeared regularly before the benches at the High Court of Madras, the Ontario Courts of Justice and Ontario Superior Courts of Justice. She graduated top 10 of her class and was the winner of the much-coveted K. Krishna Menon Prize in Law. She has both a Bachelor’s degree in Chemistry and a Master’s degree in Public Administration, having received the Silver Medal in Public Administration. As an experienced lawyer, Khamy is able to meet the needs and respond to the subtle challenges of a culturally and ethnically diverse clientele, which includes clients of Indian, Sri Lankan, Bangladeshi, and Pakistani origin. She speaks English, Tamil, Hindi, and also has basic comprehension of some South Indian languages. Khamy is accessible to her clients, constantly updating herself on the current trends in technology and the law, and how both can work together to better serve the needs of her clients. Khamy is patient and empathetic; she regularly assists clients with a broad range of matters including Mediation in Family, Employment and Commercial contracts. Legal representation in Contested and Uncontested Divorce Applications; Domestic Contracts; Affidavits; Issues related to Custody, Child Support, Spousal Support, and Property Division. Khamy is also a Notary public and provides Notary Services, and Statutory Declarations.